Samford University pharmacy Dean Charlie Sands III has received the 2013 Bowl of Hygeia Award from the Alabama Pharmacy Association (APA). The annual award goes to a pharmacist with an exceptional record of civic and community leadership, and is widely recognized as one of the pharmacy profession's most prestigious awards. Sands (left) received the award Monday, June 10, at the APA annual meeting, held this year in Biloxi, Miss. It recognized his professional work as a pharmacy educator and his community work in medical missions in Asia and in rural Alabama. Sands announced in May that he would step down as Dean of Samford's McWhorter School of Pharmacy July 1 to help establish a new pharmacy school in a restricted-access country in Asia. He will remain a member of the Samford pharmacy faculty, but will take a one-year sabbatical beginning Sept. 1 to help start the new school. 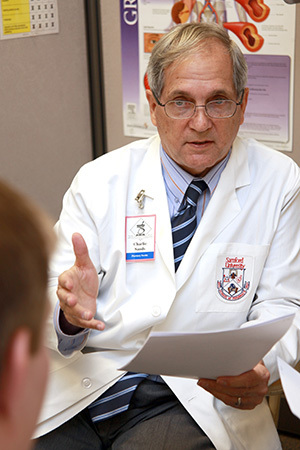 He has been a member of the McWhorter faculty since 1997, and has been dean since 2008. He and his wife, Elizabeth, have served as medical missionaries to Asian countries on several occasions beginning in 1971 in South Korea. In 1991 they became faculty members at Yanbian University Medical College in Yanji, China, serving until 2002. "We have been involved in a ministry among the Korean and Chinese people for many years, the majority of our adult lives," he said in explaining his resignation as Dean. He said he and his wife recently had contemplated returning to the medical mission field when this "unique and exciting medical mission opportunity" to start the new pharmacy school opened up. "This is a very exciting opportunity to continue and perhaps complete the ministry in Asia which we originally received in the Lord," said Sands. During his tenure on the Samford faculty, Sands also took a leading hand in establishing a link between the pharmacy school and the Sowing Seeds of Hope program in Perry County. He began a weekly cardiovascular risk reduction clinic to assist Perry County citizens who previously had no access to such treatment. He also worked with Perry County officials to make a kidney dialysis program available for the first time in the county.